What happens when you cross Star Trek’s Holodeck with the wacky irreverence of Frederator’s Bravest Warriors? 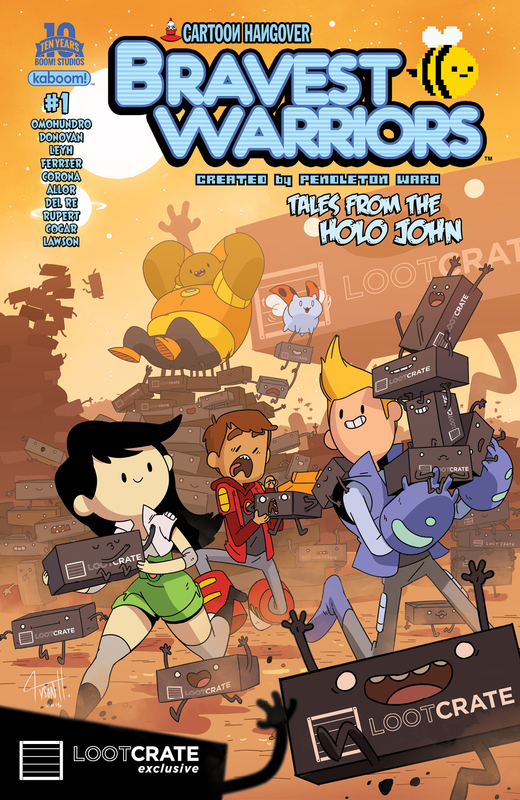 You get Bravest Warriors: Tales from the Holo John, courtesy of BOOM! Studios. (Yes, the Holo John is exactly what you think it is.) And what better way to enjoy this fun, oversized comic adventure than to receive an exclusive variant in your Loot Crate subscription box? Loot Crate and BOOM! Studios have partnered up this May to include what is Loot Crate‘s 6th variant cover and first 48-page comic ever into a crate. Bravest Warriors: Tales from the Holo John reads as five short stories, including ones by Paul Allor (Teenage Mutant Ninja Turtles); Mad Rupert (Adventure Time: Banana Guard) and John Omohundro, the voice of Danny on the Bravest Warriors animated series. This cover was drawn exclusively for Loot Crate by Tyson Hesse, who has worked on a number of Bravest Warriors covers in BOOM!‘s ongoing series under the KaBOOM! imprint. Whether you’re a huge BOOM! fan, or just genuinely curious to see what can happen in such a magical bathroom, you have until May 19th at 9pm Pacific Time to sign up for Loot Crate and receive this UNITE-themed crate.